Stains and Discolorations can be avoided and/or removed. Stains, Sulfur Problems and Odors: Prevention and Elimination. Avoiding Staining and Discoloration, caused by Well Water!!! If there is a possibility that new well water additions will contain sediments, dissolved metals or contaminants, you should consider using something to pre-filter the new water. Test your source water for iron, copper and manganese, to determine, if dissolved metals present a potential problem. It is better to avoid a problem, than to try and treat it, after the water has been added to the pool. The products below can remove sediments, metals such as iron, copper and manganese and contaminates such as sulfur. The MetalTrap Filter, available in 3 sizes, attaches to the garden hose and removes dissolved iron, copper and manganese. The MetalTrap 1-Micron Filter removes ultra-fine contaminants, including sulfur. The MetalTrap Dual-Cartridge Filter, available in 3 sizes, attaches to a garden hose and removes dissolved heavy metals and sediments. One cartridge is washable and reusable and the other is replaceable. Your well water problems might be as easy to solve, as attaching a garden hose to a cartridge-like filter. Look for the presence of rusty, tan, blue, green, purple, gray, brown or black stains. These are typically due to the presence of heavy metals, such as iron, copper or manganese. Even if there is no obvious staining, the presence of these heavy metals will cause water discoloration and possible staining, after chlorine or bromine are added or the pH is raised. Depending upon the severity of the problem, the products below can help you eliminate or avoid problems. The Stain Reversal Kit contains everything needed to remove the metal stains, eliminate the heavy metals and help prevent a recurrence, of the problem. The Stain Remover removes iron copper and manganese stains. Pool Refresh-Total Trap helps eliminate heavy metals and phosphates, by filtering or vacuuming them out of the pool water. The right products can provide a real solution, for well water problems. Test the water chemistry and adjust the pH, total alkalinity, calcium hardness and cyanuric acid, as might be necessary. A ColorQ, All-Digital Tester can perform all of the common pool water tests and eliminates the color-matching and guesswork. Some tester models, such as the #2067 ColorQ PRO 9-Plus, perform all of the common pool water tests, plus copper and iron. Better Circulation helps make everything work more effectively. The Circulator is a return jet replacement fitting, that improves filtration, eliminates dead zones that promote algae growth, improves sanitizer distribution and improves chemical dispersion. A Nano-Stick Clarifier is a 21st Century type of Pool Water Clarifying product, that helps eliminate fine particles, using only the energy of light. Nothing to install - just hang it from a ladder or rail. How to treat and avoid well water staining and discoloration? It is very common for well water to contain dissolved minerals and, when these include iron, copper or manganese compounds, staining and/or water discoloration is the result. Characteristically, when a color change is observed, immediately following the addition of chlorine, shock or chemicals that raise the pH or total alkalinity, it is a sure sign that metals are present. Staining is a detraction from the overall appearance or aesthetics of the pool, as well as an annoyance. Colored stained walls, floors, steps and other underwater surfaces can result from the untreated presence of heavy metals, such as iron, manganese and copper, in the pool water. These metals can occur naturally in water (especially well water) or may have been introduced into the pool water, as a result of corrosion. Copper algaecides are usually in a chelated or stabilized form and are not normally a problem, when used properly as directed. Pool stain removal can be accomplished with the proper materials and techniques. New or freshly resurfaced masonry pools can be more susceptible to staining, until the underwater surfaces have "cured", for about six months and come to equilibrium with the pool water. Stain avoidance treatment should be considered, whenever a water analysis indicates the potential for a problem. If possible, test the source water before it is added to the pool, as it is best to add mineral treatments prior to the addition of oxidizers (chlorine, bromine or shock) or the pH and/or total alkalinity are increased. An alternative method of dealing with known heavy metal problems is to use the METALTRAP Filter, which can physically remove the dissolved metals, as the pool water is being added. If sediments are involved, a METALTRAP Dual-Cartridge Filter should be considered, as it removes both the mineral sediments, as well as the dissolved metals. Well water, containing sulfur, can cause unpleasant odors and organic contamination, that can increase chemical usage and lead to discoloration. 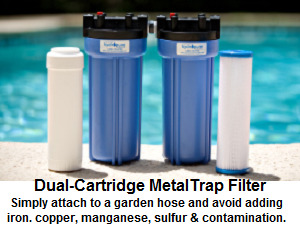 Sulfur and organic contamination can be removed by the MetalTrap 1-Micron Pre-Filter, when this cartridge-like device is used to treat the pool water and any make up water, afterwards. Picture above are the products that will help eliminate common well water problems. If problems arise, refer to the Pool Problems Page, as a source of problem-solving information, broken down into various categories. Scroll down the page and click on the linked keywords, catch phrases or images, in the archived answers below, to access additional information, on that topic or product. ► How To Avoid Problems, When Using Well Water? Your web site is a great resource for pool owners and is full of useful information. I have a pool that is feed by well water and I have all sorts of problems keeping the chemicals balanced and my pool clean. It's a daily battle. My biggest issue occurs when I add chlorine to the pool. The pool goes greenish brown and a by product is produced that settles at the bottom. I've read the information on your website and it looks like my best solution is the dual cartridge metal trap. I have 13,000 gallon pool. How often would I need to change out the cartridge? The dual cartridge MetalTrap filter is what you need. How long the cartridges will last will deep on the sediment and dissolved metals content. There are 3 series: 6, 14 and 22. The six series might last for 12,000 gallons and the fourteen series for 28,000 gallons. It could last longer or less, depending on your particular water quality. Better you spend money on preventing the problems metals cause, rather than waste it constant chemical treatments. Your problem sounds like iron. Dealing with well water with a high iron and or copper content can be a challenge. It is best handled with a MetalTrap Dual Filter. 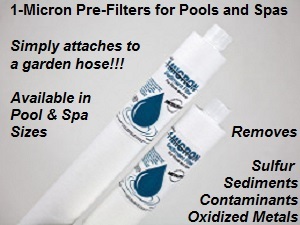 The 5-micron pre-filter will remove the particulated metals and is washable and reusable. The second MetalTrap Filter will remove up to 1 PPM of metals, from its rated volume. You will have to test the water coming out, for iron and copper, to know when the cartridge is exhausted. This cartridge is not washable, but is replaceable. It is important to keep the flow rate low, about 5-8 gallons per minute, when metals content is high. I would expect that you will require several Metal Trap Filter refills, based on the high metals content. I hope that I have been helpful. If so, please tell your friends and dealers about the website. ► How Do I Avoid The Staining, If Well Water Is Used? I plan on having a 18,000 gallon inground gunite pool installed, in about one month. My next door neighbor had a similar pool installed last year and he went through a terrible time, dealing with staining and discoloration, because of the well water he used. I am not even sure that he has solved the problem, as his pool is still covered. I started to some research and found your website, through Google. It looks like I will be using similar well water (private). I don't think my softener can handle all that water and trucking in water does not seem to be an affordable option. I took the first step and had a local pool dealer test for copper and iron. He found 0.0 PPM of copper and 1.1 PPM of iron. He did not have a manganese test. What would you do in this situation? I think you took the right first step: planning ahead. If you simply filled the pool, staining and discoloration would have surely followed. Just adding a metal treatment might not solve the problem or at least not permanently. Most metal "removers" are mislabeled or referred to in a incorrect manner. At best, they chelate or complex the heavy metals and do not actually remove the heavy metals. So although, staining and discoloration are reduced or eliminated, it may not permanent. The problem is that many of the most popular ones are based on organic phosphonic acid products and over time, degrade to the ortho-phosphate form and the original problem starts to return. Not only do you get the staining back, but you now have a phosphate problem to deal with. 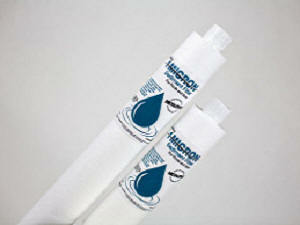 Start by backwashing or cleaning the filter, as you don't want to dissolve any metals that the filter may have removed. I would use a METALTRAP Dual-Cartridge Filter to treat all of the water, as it is being added to the pool. It will permanently remove any heavy metals present. Nothing is better than removing the metals. In addition, you might add a dose of Liquid METALTRAP, when the pool is 1/2 filled. This will help provide some insurance, should metals get added to the pool, because of heavy rains washing debris into the pool or as the result of corrosion of equipment, due to low pH. Avoid using algaecides or products that contain metals. A polymer algaecide would be best. For sanitizing I would think in terms of chlorine and a salt chlorine generator would be an excellent choice and avoid ionizers, in general. When the pool is full adjust the water chemistry to the suggested ranges and there should be no discoloration or staining. In the future, whenever new water is added, make sure that you run it through the METALTRAP Dual-Cartridge Filter. Avoiding the problem, is the best solution. Good luck with the pool and I hope that the information will prove helpful. ► Phosphate Problems With Well Water? My well is adding phosphates to our pool via the auto-fill. Will your Fresh Start product capture the phosphates or just metals? If so, can I attach it to one inch PVC line? Do you have another suggestion or better idea if I am going down the wrong path? Thanks. Most likely the well water contains iron, as well. I would use a METALTRAP Filter, to treat all new water being added to the pool. This will remove iron, copper and other heavy metals, from all new water additions. It won't remove phosphates. To do that you can add the POOL REFRESH system, to the pool. It will precipitate the phosphates and heavy metals, so that they can be vacuumed and/or filtered out. When the filter is cleaned, these problematic minerals are out of the pool, permanently. Test the water periodically, to see if any follow up treatments are necessary. I hope this information will help solve the problem. ► Used Water From A Stream? I thought I could save some money, by filling the pool from a stream that runs behind my property. It was a bad mistake, because as I added the chemicals, the color went from a tea color to rusty brown. I have a 15,000 gallon above ground pool, which has horrible looking water and stains to match. Can you offer a solution? You have an iron problem at least, but I suspect that you realize this, by now. First of all don't add any chlorine, as it will make the next step easier. Add a bottle of a 60% polymer algaecide, to help maintain water quality, while we tackle this problem. Get the pH to 6.8-7.2 and allow the chlorine level to bottom out at zero. Add 1.5-2.0 pounds of METALTRAP Stain Remover and keep the water filtering, which should allow the iron and other heavy metals to go back into solution. This should eliminate the stains, but the discoloration of the water can remain. It all depends on concentration of the iron, copper or manganese. Running a test for these heavy metals, at this point, could be very helpful. 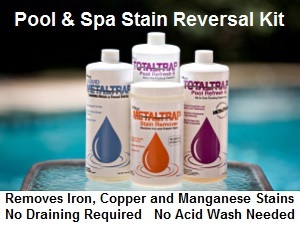 When the free chlorine has reached close to 0 PPM, you should add the METALTRAP Stain Remover. It will help to solubilize the metals, that have stained the underwater surfa ces. Use a brush to scrub the surfaces, as this could speed the process. Once the stains are gone, you should add two quarts of Liquid METALTRAP, for each 1 PPM of metals found. This product is a new chelating agent and is 100% phosphate free. It tends to form stable complex compounds with the heavy metals and does not break down quickly or lose effectiveness, as do products based on phosphonic acid derivatives. Liquid METALTRAP has the added benefit of maintaining its effectiveness over a broader pH range, than the phosphonic acid based products and because it contains no phosphates, will not add to your problem, by adding phosphates to the pool water. After the Liquid METALTRAP has been added, keep the filter running 24/7 and wait 2-3 days before adding chlorine. Add the chlorine slowly, in 2-3 pound increments, until a free chlorine level is re-established. A large amount of chlorine will be required, because it will have to decompose the ascorbic acid, first. The sole purpose of the ascorbic acid was to solubilize the metals, so that they could be chelated by the Liquid METALTRAP. In the future, add a dose of Liquid METALTRAP, monthly and prior to adding new water. A METALTRAP Filter, which is cartridge like, will allow you to remove metals from the pool, by recirculating the pool water, using a small submersible pump and a garden hose, and can be used to treat new water that is added to the pool. It will trap and remove the metals and that is the best way to deal with this problem. I hope that this information will prove helpful. I e-mailed you a few weeks ago for information on chlorine generators, thank you for the helpful info. Since that time, my husband and I have been gathering information from some of our local pool dealers and of course now I am more confused than ever. We have a 3 yr old in-ground 20,500 gal. vinyl lined, biguanide maintained pool located in CT. We had an algae problem last year and want to discontinue the biguanide. Our pool dealer sells the a salt chlorinator system, but advised us against using one because we have well water with known high iron and manganese levels. (we do have a water system softener system). When we filled our pool initially, we used half well water and half was delivered. The water was tested and not found to have metals present. We purchased a Dolphin robotic pool cleaner for this season. Our pool dealer recommends that we change the sand in our filter and now that we have the automatic pool cleaner, to continue with the biguanide. I stopped in at another pool dealer and they suggested trying a "copper-based product" as an alternative to using biguanide. She said they have not found any staining problems, even with well water. I was doing some research about this "copper-based product" and I am now concerned about the copper. Most of the pool forums I visit say to stay away from all copper based products in general. I was considering going with regular chlorine, but I am concerned about the liner bleaching. Any advice you can give me is greatly appreciated. Thank you in advance. Sincerely. If you have a sand filter that is operating properly and would like to improve the water quality, replacing the sand with a zeolite sand replacement filter media, which should be able to remove those small particles, that previously could have passed right through the filter. It can even take out some of the metals! Why hasn't someone suggested this before? A zeolite sand filter replacement weights a lot less than sand. You should require one-half of the weight of sand. That means in place of 300 pounds of ordinary filter sand, you will only require 150 pounds of zeolite. You need to give up on biguanide, no matter what. It is common for people to develop resistant microorganisms, after a few years of use. Once this happens, you should make the switch permanent. The use of copper products, with well water, is poorly advised. If you have metals in the water, you will have to treat them with appropriate products. Copper will just become part of the problem and will require even more metal treatment, while offering diminished performance. I have a wealth of experience with copper products and I never believed their use with metal-laden well water was the best move. To switch from biguanide, you need to add 4 pounds or gallons of chlorine per 5,000 gallons of pool water. Add more, if necessary, until a stable FREE CHLORINE level is maintained. However, before doing this I suggest that you add at least a double dose of a phosphate-free, metal treatment, such as Liquid METALTRAP, even if the tests are negative. If not negative, add at least one dose per 0.5 PPM. More is better! Consider adding a METALTRAP Filter to treat all new water. Nothing is better than keep metals out of the pool. Liner bleaching can occur when high levels of chlorine are maintained for long periods of time or there is direct contact with a chlorine product. 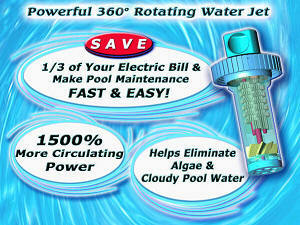 A salt chlorine generator helps you avoid high concentrations and the need to shock the pool frequently. A turn of the dial allows for to set the level. With a Robotic Pool Cleaner cleaning and filtering the bottom, there will be much better bottom circulation and fewer algae problems. Which now brings us back to the salt chlorinator. It is a much better choice than ordinary chlorine. Your pool has been filled with acceptable water and you should try and keep it that way. Add a dose of a metal treatment monthly or prior to adding new water. As a bonus, it will help keep the salt chlorinator cell free of scale. A salt chlorine generator will better serve your pool needs, cause less liner fading and be no more of a problem with metals, than would the hydrogen peroxide shock used with biguanide or the oxidizer used with the copper product or just plain old chlorine. I think it is the right choice! Good luck and I hope that I have been helpful. Dealing with well water metals and stain problems. It does pay to plan ahead, in your situation. If you add the well water through a METALTRAP Dual-Cartridge Filter, the heavy metals will be permanently removed. When the pool needs to be topped off, pass all the water through the METALTRAP Filter. Removing metals, as the pool fills is the best insurance against future problems. Remember, always use the METALTRAP Filter to treat all new water! There are chemicals means to treat metal problems and/or remove the stains they cause. Not all of these chemicals are equally effective, some are ineffective at higher pH levels and others contain phosphates, which can lead to other problems. 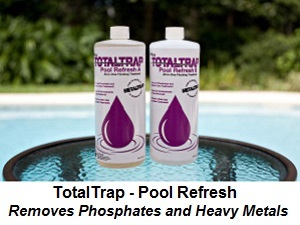 Liquid METALTRAP is phosphate free and works over the full pool pH range and beyond. Adding this chemical can help avoid staining and/or discoloration. Good luck and I hope that I've been helpful. ► Stains Keep Coming Back? Help!!! I have a fiberglass pool and it all started, when my well water seemed to start showing iron. My pH was on the low side, because of using trichlor tablets and when I raised the pH, I ended up with stains all over the pool. First I added some metal removers, which failed to make any difference. Then, I was told ascorbic acid would solve the problem. And it did! They told me to add more metal remover, wait a few days and then start adding chlorine. It took a while to get the chlorine back to normal. It seemed to be solved at last. Over the next few weeks, the staining slowly returned and now I am back to square one. The dealer says that I need to repeat the process and add twice as much metal remover and wait a week, before adding chlorine. I think he is clutching at straws, at my expense. Do you have a solution for a recurring stain? There is a permanent solution! But, first we need to set the record straight. Dealers and some manufacturers love to use the ter m "removes metals." If it truly removed the metals, where did they go and why does the staining keep returning? At best these product complex with heavy metals and allow them to remain in solution, without staining. Most of these products contain a phosphonic acid chemical, which form a colorless complex with most heavy metals. The problem is that they slowly degrade to ortho-phosphate, over time and faster, if the pH is high. Now the staining returns. In addition, you now have a phosphate problem, as well. The static negative electrical charge on the fiberglass tends to attract the positively charged heavy metal ions and staining starts, once again. There are two ways to approach this problem and break the cycle. Allow the free chlorine to zero out and add a quart of 60% polymer algaecide to maintain the water, while there is no chlorine present. Get the pH to about 7.0. Now add METALTRAP Stain Remover and keep the filter on 24/7. Scrub the walls, to help things along. In due course, the stains will be removed. You have been here before! There are two choices to make, at this point. You can use the cartridge-like, METALTRAP Filter with a garden hose and a small submersible or cover pump and recirculate the pool water. As the water passes through the METALTRAP Filter, the heavy metals are trapped and removed permanently. It may take a few days, but if you test the water for iron, you will see the iron level (in your case) dropping. 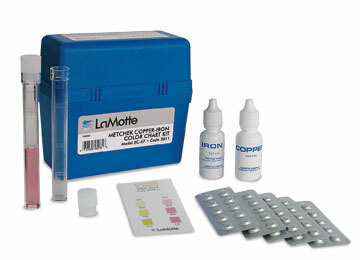 Once the iron level gets down to under 0.1 PPM, you might want to add a dose of Liquid METALTRAP. This is a true chelating agent, that contains no phosphates and is unaffected by normal pool chemistry or higher pH levels. Give it another days or so and start to add chlorine, to re-establish a proper level. You should be home free. To keep it that way, add a monthly dose of Liquid METALTRAP and run all new water additions through the METALTRAP Filter. The other option would be to use only the Liquid METALTRAP. I think the METALTRAP FILTER is the way to go. Thereafter, once a season, recirculate all of the pool water, through the METALTRAP Filter, as added protection. This regimen is the best way to deal with a recurring stain problem. I hope that this information will prove useful. ► Improving Well Water Quality? We have a vacation home with an above ground pool. Our only water source is a well. There is always discoloration upon filling, after chemicals are added. I have added chemicals, as recommended, but it doesn't seem to solve the problem. Is there a better way? The METALTRAP Dual-Cartridge Filter will permanently remove metals from water, as well as sediments, up to 5-microns in size. Use it to fill the pool and other household uses. It meets the requirements of NSF-60 and NSF-61, as relates to water quality. This should make a clear difference is water quality, color and even taste. I hope that this information will be helpful. ► Sulfur Odor: Bad Smell and Ugly Color? I guess you should bring in a water sample to a local dealer. He won't be able to test for all that is wrong. From the smell of things, you are going to need some real help. I suggest using a MetalTrap 1-Micron Pre-Filter and a small submersible, along with a garden hose to recirculate the water. Keep the pool filter running. The pre-filter should be able to remove the offensive smelling sulfur and other organic contamination. Get the chemistry right and a free chlorine of 5 PPM and see what it looks like. As the water passes through the pre-filter, it should improve. Adding a Nano-Stick Clarifier can help clear the water, at a faster rate. In the future, use the METALTRAP Dual-Cartridge Filter, to remove sulfur, metals and contaminants, when adding water to top off the pool. I hope this helps make a difference. ► Used Well Water - Sulfur Smell and Ugly Greenish Color? We are nearly finished filling our 18,000 gallons above ground pool, with well water. It smells like there is a Sulfur odor and has a really unappealing, murky greenish brown color. We live in the boondocks and don't have city water. I was unable to use our in-home filter system. I was told, because of the volume required. Where should I do? This is our first pool and I realize that I am off to a bad start. You should bring in a water sample to a local dealer. He won't be able to test for all that is wrong. From the smell of things, you are going to need some real help. I suggest using a MetalTrap Dual-Cartridge Filter and a small submersible, along with a garden hose to recirculate the water. Keep the pool filter running. The pre-filter should be able to remove the offensive smelling sulfur and other organic contamination. Your well water is obviously of poor quality. You would have been better off having water trucked in, if there was no other option. However, draining the pool could cause the liner to shrink and that would not be good. So let's try and fix what you have. As you recirculate the water through the MetalTrap Dual Cartridge Filter, it will slowly improve. Run it 24/7, because the flow rate is only 5-7 gallons a minute. Keep the pool filter running 24/7, as well. Get the chemistry right and a free chlorine of 5 PPM and see what it looks like. Adding a Nano-Stick Clarifier, which lasts for 4-6 months, can help the pool filter remove some of the suspended solids. Watch the filter pressure and clean or backwash wash, as needed. In the future, considering using the METALTRAP Dual-Cartridge Filter, to remove sulfur, metals and contaminants, when adding water to top off the pool. I hope this helps make a difference I hope this helps make a difference. ► Grayish Spots In Fiberglass Pool? I have a 18 by 36 fiberglass in ground pool, and I have noticed lately that there is round grayish black spots all over the bottom, I tried scrubbing them off, but nothing, I have shocked it and put in algaecide and nothing happens, what can I do to get rid of these. We use well water, but it is considered to be of good quality. The stains could be due to a metal in the water: possibly iron and/or copper. Cobalt can be a problem with older fiberglass pools. If the problem turns out to be cobalt, there are products to try. However, they may not work and the only recourse might be a refinishing. Newer fiberglass products seem not be affected to the same extent, as older technology finishes. Try this and, hopefully, it will remove the colored spots and stains. Add 1/2 pound of pH reducer powder to a white sock, shut off the filter and drop onto a stain. Position using the vacuum pole and leave in place for about 15 minutes. Move the sock around with the vacuum pole after this period. If the stain is gone, repeat elsewhere, as needed. Once the stains are gone, add a dose of phosphate-free, Liquid METALTRAP, in order to avoid a recurrence. If not try the same technique using ascorbic acid - some pool dealer carry the product. Try placing a few vitamin C tablets on the spots. 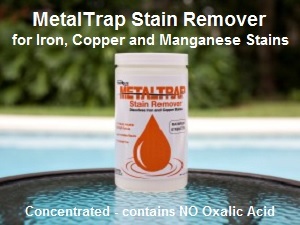 If this works it indicates that METALTRAP Stain Remover will work and that it is a metal stain. Fiberglass has a negative electrical charge and can attract positively charged metallic ions, causing the development of a stain. 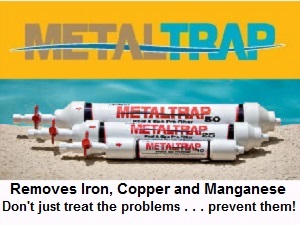 The problem can be solved more effectively, with the METALTRAP Filter. This cartridge-like filter is used to recirculate the pool water and, as water passes through its special media, metals are permanently removed. If you use it to treat all new water and seasonally, thereafter, you should be able to better maintain the pool's appearance. I hope that I have been helpful. ► Well Water Stain Problem? Alan, We have a 30,000 gal. in-ground pool that is filled from a private well on an ionization system with a sand filter. About (2) years ago, we started noticing dark stains in the pool. At first it was only on the fiberglass steps, but now we also have it forming on the vinyl especially in the deep end. By reading other articles by you, we feel problem is caused by iron from the well water (have noticed some staining in house toilets). If this is true, will adding a solution to the pool to remove these stains hurt the ionization system? Thanks. Yes, the addition of a mineral treatment can affect the copper ions. Have the water tested for iron and copper. The copper at a few tenths of a PPM should be from the ionizer. Any iron would be undesirable! The iron should be treated with a metal treatment: there is little choice in the matter. Some of the ionizer manufacturers will advise you to add a dose of a chelated copper algaecide to maintain the effectiveness of the copper ion concentration. Read the instruction manual for comments on this topic. If it were my choice, I would forgo the addition of the copper algaecide, inasmuch as we are not certain about the cause of the staining. Instead, I would add a quart of a 60% Polymer Algaecide and continue with the maintenance dose for another few weeks. By that time, the copper concentration should have reached a new equilibrium. There is a another solution, that can really make a difference with well water: the METALTRAP Filter physically removes iron, from the pool, as the water is recirculated through the METALTRAP Filter. Even better would be a Dual-Cartridge, MetalTrap Filter which will remove both dissolved and undissolved metals. Using Dual-Cartridge, METALTRAP Filter, to treat all new water, helps keep new additions of iron and other metals out and minimizes the possibility of staining. You could use The METALTRAP Filter to recirculate the pool water. It will remove the iron, as well as the copper. Once done, you can test the copper level and replenish with a one-time addition of a copper algaecide. Afterwards, use the METALTRAP Filter, when any new water is added, to prevent the introduction of iron and other heavy metals. I hope that the advice proves helpful. We took your advice and used a metal treatment product. Brown stains on steps are gone! I am so disgusted when I think of what we have done this summer and last! Two different companies tested the well water and pool water for metal and said there was none! How often, as a general rule, should we use the metal treatment product? The bottle did have a maintenance dosage amount recommended. Thanks so much! Pool stores usually only test for iron and copper. The problem could have been another metal or there was something in the water that interfered with the test. The main thing is that your problem sounded like it was caused by a metal. Follow the maintenance dosage, as specified on the label, and add monthly and whenever new make up water is added. Inasmuch you are on well water, using the METALTRAP Filter or Dual-Cartridge METALTRAP Filter (an even better choice, when well water is being used) to treat all new water, helps keep new additions of iron and other metals out and minimizes the possibility of staining. You could, also, use The METALTRAP Filter or the Dual-Cartridge METALTRAP Filter to recirculate the pool water and lower the heavy metal content, already present in the pool water. There is no set rule for these things, as much depends on the metals content and the overall pool chemistry. More often is always the safer choice. Monthly might be reasonable. Glad it all worked out.